Yes!! already everybody is getting a lot of spam in our email accounts. Thanks to the spam filters, otherwise our inbox would be rendered useless. I just came across this new thing in yahoo mail, where if you give an invalid username and some password, it takes to a page similar to the one shown below. Remember, an invalid id and invalid password. Look at the text I have blocked in the screenshot. Won’t it pave the way for more spam? 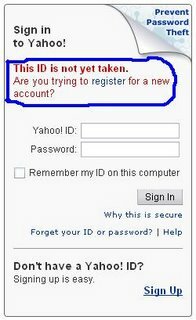 I think the latest Yahoo page is not acting as Spam filter, but rather it is ment for the “Website Phishing”-this is the term used to validate that the user logged-in the website is the genuine Yahoo user or Account Holder for that Username, and not the hacker or dummy user- It is helpful in the sense if somebody anywhere else in the world trying to access your information than he can not, because with this feature you are providing your log-in information as well your machine information, so each time you log-in it validates both the thing and you can log-in to machine if and only if you are on the same machine. For more information about it you can find in the Yahoo it self, Click on the Passeword Protection link. P.S. Jadeja, aren’t you the one I met that day at Mircosoft’s Office some time back? Btw, i can give some random id and password and find out whether an id exists or not from the text shown. Bots can do that at amazing speed though. A bot would probably use the “Check availability” option that is avaliable during new registration. Giving user name and password and then checking like you have said will take more time than the former. my 0.5 cents on the matter, Spammer won’t gain by knowning if an id is free bcoz I assume they won’t make lots of money unless their spams get clicked and that can happen only when some mails do reach Inbox where they end up being opened and acted upon. Btw can I have 2-3hrs of u at my home in Nov’06 for doing a one to one on simple tips that would be useful if packaged with audio-video-screen shot combo…lets meet some time and just make simple content to get started in blogging in a spammy world…Can u be my Sheperd in the journey dear..
Sure Sunil… i have gone through the temp ids of gmail :).. and with regards to spam, it was just a view point from a diff angle :). I think i have spelt it correct this time 😉 Thanks sir! I am fine i hope you are also doing great. Hi Yuvi, it is been a long time since we had a chat! Ya i am the same guy… 🙂 How are you doing? How is the life going?